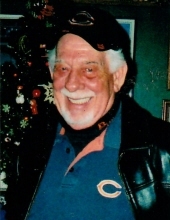 William Arthur Heintz, 79, of Rockton, IL died the morning of January 20, 2019 in his home after a long four- and half-year illness. Born March 18, 1939 in Sterling, IL, son of Mr. and Mrs. William W. Heintz and Sarah Elizabeth (Boze) Heintz. He graduated from Sterling High School before living in Rockton for 43 years. William married the former Janet Louise Carlock in Sterling, IL on June 23, 1963. He was employed by Chrysler for 30 years and was a veteran of the United States Navy. William also was a member of the Rockton American Legion and the Rockton Boat Club. Survivors include daughter Shelly A. “Heintz” Gaudette of Rockton, IL; son-in-law Darren M. Gaudette of Rockton, IL; son William P. Heintz; son-in-law Richard Jaeger of Rockton, IL; grandchildren Derek S. Allen, Brooklyn Gaudette, Daizy Jaeger, Kittra Love, Jason Jaeger, Janet Jaeger and Leo Valdez. He was preceded in death by his parents, wife Janet L. Carlock Heintz and daughter Wendy L. Heintz Jaeger. A visitation will be held between 11:00 a.m. and 12:30 p.m., Saturday, February 2, 2019 at McCorkle Funeral Home – Rockton Chapel 767 N. Blackhawk Blvd. Rockton, IL. Burial will be in Rockton Township Cemetery in Rockton, IL. To send flowers or a remembrance gift to the family of William Arthur Heintz, please visit our Tribute Store. "Email Address" would like to share the life celebration of William Arthur Heintz. Click on the "link" to go to share a favorite memory or leave a condolence message for the family.